Princess employees cleared brush and pruned trees to keep trails clear. They also used GPS devices to locate geocaching prizes hidden for volunteers. 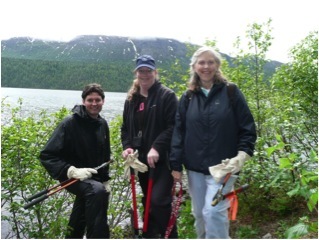 The goal is to have Princess employees volunteering at least once a month on trails projects at Byers Lake. National Trails Day was launched in 1993 and is celebrated on the first Saturday of June. As part of an on-going partnership between Princess and Denali State Park, employees at the Mt. McKinley Princess Wilderness Lodge worked on trails near Byers Lake during National Trails Day. Princess staff Dave Arnott, Amanda Clark and Debbie Thompson admire their trail work at Byers Lake.